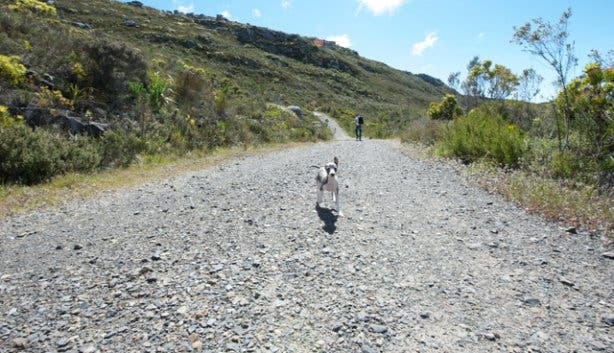 It’s a beautiful day in Cape Town, not too hot and not too cold; perfect for a hike. I’m on my way from Cape Town central to Silvermine (a 20 minute drive) to hike up to Elephant’s Eye cave. The easiest route is from Silvermine reservoir, giving you the advantage of climbing most of the height by car up Ou Kaapse Weg. Silvermine forms part of the Table Mountain National Park. We pay the conservation fee and drive a few kilometres to the Silvermine reservoir car park (also the only bathroom facility on the hike). The good signage (throughout the whole hike) points us in the right direction. Silvermine was made part of Table Mountain National Park on 1 May 1998, thereby ensuring that its unique and diverse natural offering will be protected. 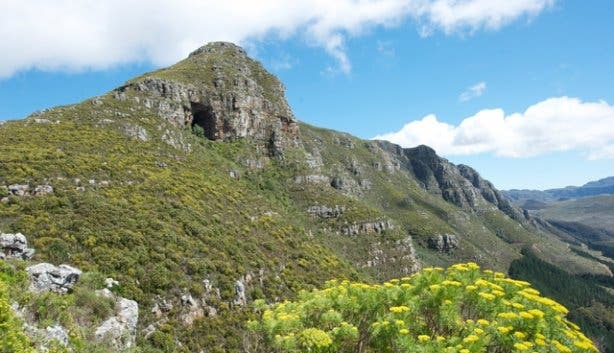 Silvermine offers spectacular scenery, an abundance of fynbos and is a popular spot for all sorts of activities including hiking, caving, rock-climbing and mountain-biking. The name is derived from the fact that this mountain looks like the shape of an elephant’s head and the cave is perfectly located where the eye would be. This leisurely hike brings us past indigenous fynbos, we even see the king proteas bloom - a joy for the eyes and easy on your feet. The hike’s inclines are very minor and an unfit person could do this route too. Even my 12-weeks-old Italian greyhound puppy enjoyed the hike. Picnic. 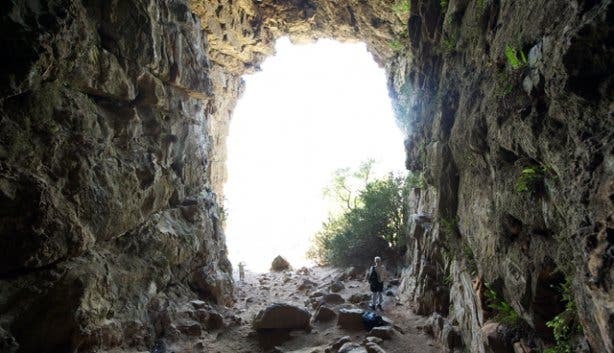 Fill your backpack with goodies and water for a memorable picnic with a view in the cave itself. Garbage bag. There are only dustbins at the car park, keep it tidy and leave no trace. Hiking shoes. 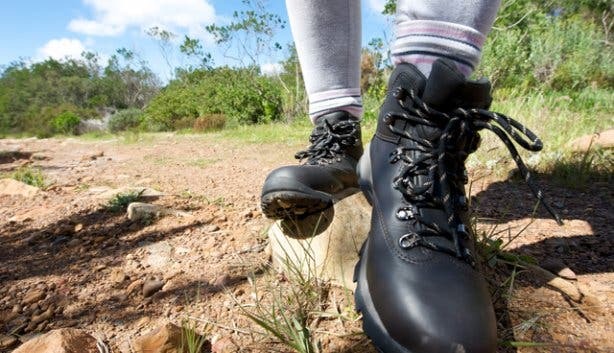 To keep it safe, wear hiking boots that give your feet a strong hold. There’s a bit of semi-climbing and a few steep paths so you’ll need shoes with a good grip. Hats and sunblock.There are patches of shade for you to rest in but the majority of the walk is exposed. It’s a good idea to get an early start to avoid the midday sun. Camera. The views are incredible and the flowers definitely worth a shot. Money. There’s a conservation fee (see in the footer). Swimsuit. A swim in the Silvermine reservoir after the hike is refreshing. Braai equipment and meat. In winter you can braai in dedicated spots around the Silvermine dam. Numbers. Take these numbers up with you just in case and use them for your planning. Call the emergency number if you get lost or injured +27 (0)86 110 6417. If you want to stay overnight, contact +27 (0)21 422 2816 – the Silvermine Tented Camp is the ideal base from which to experience Silvermine. Braai facilities for larger groups are available for hire, please contact +27 (0)21 712 7471. 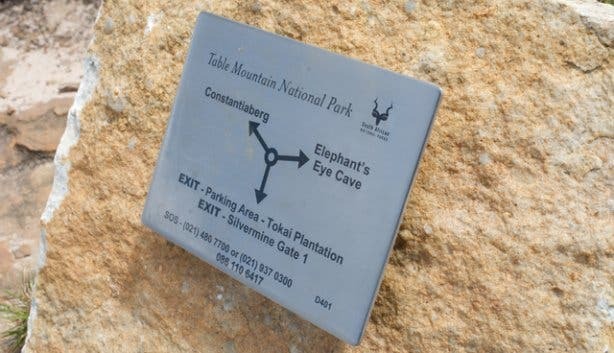 Tokai Lookout and Elephant’s Eye are found on the slopes of Constantiaberg, and offer excellent views of the Cape Flats and False Bay. 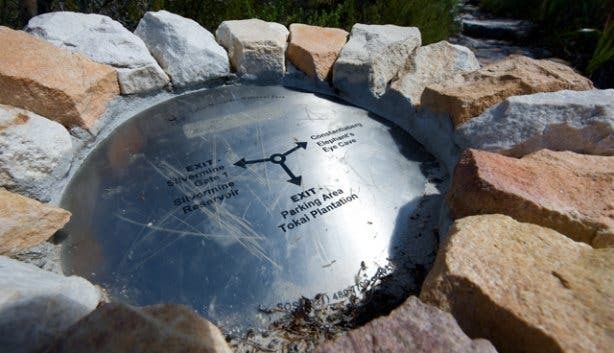 These can be accessed from the car park at the Silvermine reservoir. The reservoir setting, surrounded by pine trees reflected in the surface of the water, is a nice place to start and end with a picnic and swim. This is an easy hike, most of the walk is along gravel road, which makes the going a lot more relaxed. 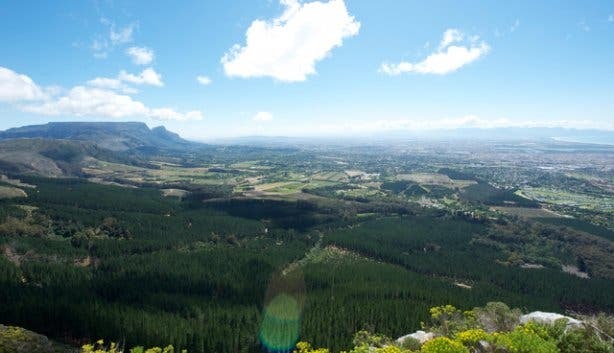 You will find great view points en route, views as if you were in a helicopter; some call them ’the most photogenic views in all of the Western Cape’. You will pass clusters of pine trees, the Prinzkasteel Stream and a fire lookout stone hut for the foresters, but don’t have your picnic here, Elephant’s Eye cave is too close. From the fire lookout you can see the cave, literally a big hole in the side of the mountain. Your reward of the hike is definitely this stop. 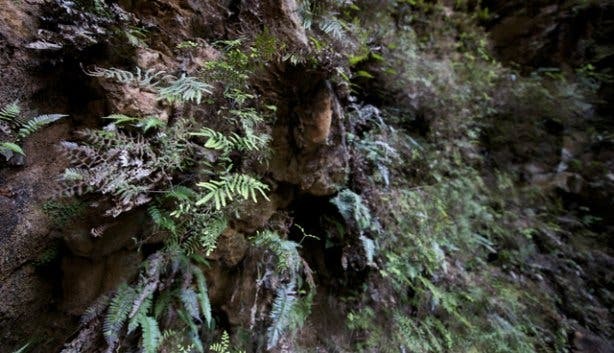 The roof of the cave is partly covered in green ferns. It’s mystical. 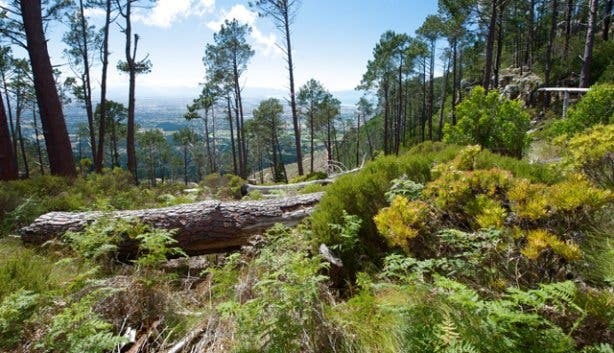 From here you can view the dark green forests and vineyards of Tokai and Constantia. Time to unpack your picnic and enjoy the spectacular views. Duration: Two hours (or longer) including a picnic at Elephant’s Eye cave. Take the M3 towards Tokai, take the Tokai Road off-ramp, and turn right under the M3 bridge. Follow Tokai Road all the way to the end, passing Tokai Forest picnic area, and turning left to the Arboretum when you reach the T-junction at the Manor House. Sign in at the thatch gate. The path is clearly marked with signs bearing an elephant. This is quite a long climb up to Elephant’s Eye, but it makes it a more challenging hike. Duration: It is a comfortable two hour walk up to the cave, so plan 4.5 hours at least including a lovely picnic at the cave. Grysbok, lynx, baboon, porcupine, genet and tortoise have been recorded. You may also spot a variety of reptiles, insects and amphibians. Birds often seen in Silvermine are the Orange Breasted and Malachite Sunbirds, Cape Sugarbirds, Rock Kestrels, Kites, Buzzards and Peregrine Falcons. The majestic Black Eagle is also seen here occasionally. 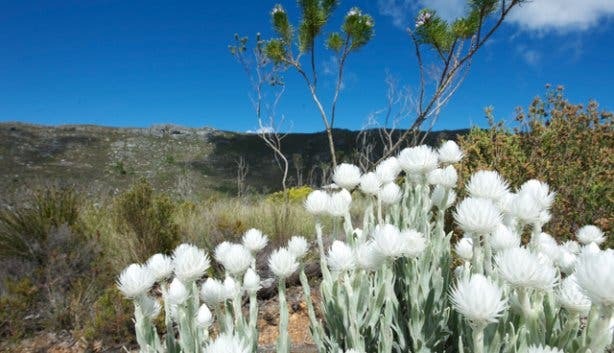 Silvermine is located within the magnificent Cape Floral Kingdom, the smallest but most diverse of the six floral kingdoms in the world, with an enormous variety of plant species. A large number of these plants are rare and endangered and some are found no where else in the world. Fynbos is the most dominant vegetation type. To date almost 900 species have been recorded with large numbers of Proteas, Ericas, and Restios occurring. Remarkable specimens of the protea family include: Mimetes hirtus, or bottlebrush, which are endemic, Protea nitida or Waboom, Protea cynaroides or King Protea, Leucospernum concocarpodendron or Kreupelhout. Depending on the season you will see parts of the mountainside coloured by the many Erica species. Trivia: What do an elephant’s eye and a silver mine have in common? Nothing at all really, except they’re both misnomers for places of interest on the Silvermine Circuit hike, starting near the top of Ou Kaapse Weg. Check out our Facebook album of the hike, and follow us on Twitter to find out where (and what) we’ll be hiking next. Plus, subscribe to our weekly newsletter for a seven day weather forecast.